I’ve been making sourdough bread, pretty regularly, like a good little foodie, for about six months now. I’ll be frank, it’s not perfect. It’s got the taste, the crumb, the crust but the loaves are still a bit, well, flat. I’ve got a problem with structure. The starter is also called the ‘mother’. I’m so glad to hear that there is a goddess culture within the food world. 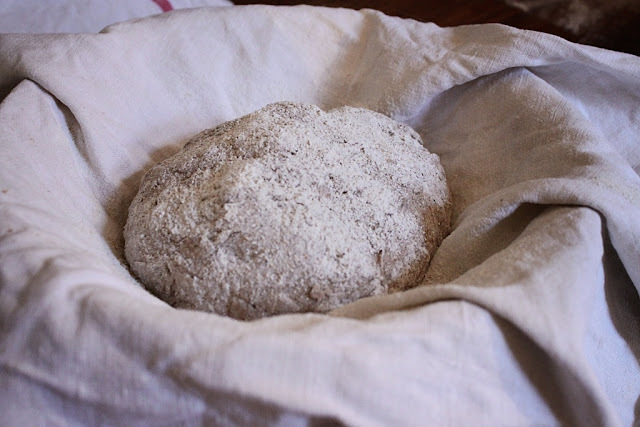 Make the starter with rye flour, it takes about five days initially. I learnt this from Dan Lepard. If you bake a loaf every day, refresh the starter every day. What does this mean? Keep your starter in a jar and every day, empty out enough of it (say 2/3rds) to leave room enough to add one cup flour (I alternate rye and strong white) and one cup water. A starter is alive and kicking if it froths up in the hours after you have fed it. 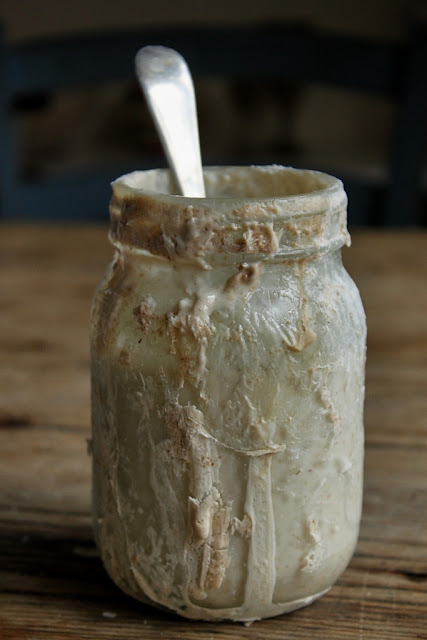 Texture of starter: some people have thick gloopy starters and some people have thin ones. Take that into account when you are thinking of ‘hydration’ or how much water to put in your dough. Once you’ve got your starter to a stable state, you can keep it in the fridge and ‘refresh it’ every few days if you don’t bake every day. A recently refreshed starter gives you a better structured loaf. If I’ve recently refreshed the starter, I use a cup of what I would usually throw away, to start my loaf. I don’t usually use cups to measure, but I’ve found that I do with making bread. I keep one in the flour sack. Use the same cup for everything, that way you are working with ratio not measurements. I fill a cup with flour loosely, then level it off. If you are using cups, make sure you use the same way of filling it each time. Otherwise one cup could be tightly packed, the next loosely and the amount of flour in your cup could vary by 50g easily. If you are embarking on the sourdough journey, I recommend that you order some large sacks of flour from Shipton Mill. They deliver and it works out a great deal cheaper than constantly buying small bags of flour. I have a 16 kilo sack of strong white flour. If you live near a traditional mill, then get flour from them. Support local farmers and millers and you’ll get a more interesting, better loaf. Going on holiday: unlike Sweden we don’t have a starter hotel. So I just keep it in the fridge with clingfilm over the top of the jar. When I was away for a month, I checked on it and even though it smelt funny, with the addition of a little flour and water, it sprung back into life. Starters are remarkably strong and rarely die. When it has gone green though, I do draw the line and chuck it. The oldest starter in the UK, around 300 years old, comes from Italy and lives at Franco Manca pizzeria in Brixton. If you ask nicely they will give you a bit. Hydration is the bakers favourite word. What is it? It’s the ratio of water you combine with the flour. For instance my starter is refreshed with 100% hydration, ie: one cup flour, one cup water. The thinking is that the more hydration, the stickier the dough, the more moisture, with a more open crumb structure, in your final bread. A good sourdough loaf lasts days, with no additives or e numbers whatsoever. 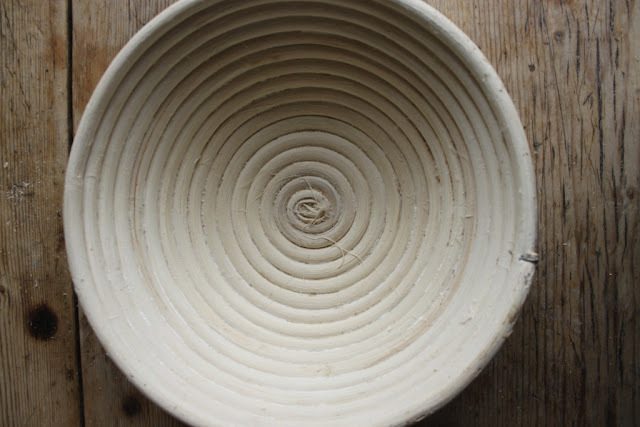 Wet your hands with water and your dough shouldn’t stick when handling if you are kneading. I learnt this from Jane Mason at Virtuous Bread. The amount of water in a dough depends on the weather, your flour, a million things. So learn as you go, what your dough should feel like. Eventually you won’t need a recipe. Folding and tucking: when your dough is proving, every few hours, pull the dough together carefully by stretching one side from the bottom over to the other side. You are not pummeling it down, you are merely strengthening the structure. I learnt this from Richard Bertinet. I often overproof my dough, because I forget about it. You can tell when this happens as your dough gets really big, then you go back and it’s burst and sunk. Try not to do this, it weakens the life in your loaf. It’s probably why I don’t have a good structure. Those pretty birch wood bannetons are a nightmare! The dough always sticks, I’ve ruined so many loaves this way. I’ve tried painting it with layers of cornflour and water. The dough stuck. I’ve tried to flour it heavily and dig the flour into each groove. The dough stuck. Scoring: every baker has a signature design slashing on top of their bread. They all have their own special ‘lame’ even (French for blade). I’m rubbish at remembering to slash, at the actual slashing. But right now I just let the loaf crack open organically. However, you are supposed to control this by cutting the top of the loaf, just before it goes in the oven, with say a square or a cross. Baking: in a domestic oven is not going to produce the results you get in a commercial bakery. 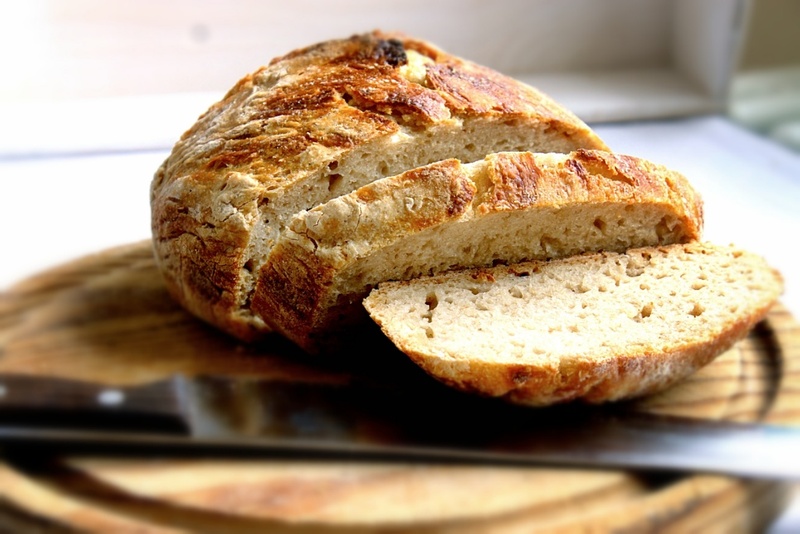 Domestic ovens don’t get hot or steamy enough, to give your loaf a fantastic crust. I’m baking in an Aga, so I use a slightly floured (with flour or cornmeal) peel (that long handled ‘spade’ you see in pizzerias) and bake on the floor of the hottest oven. To get a crust you can spray the oven with water as you put in the loaf. But the easiest is to use a ‘dutch oven’, in other words, a heavy cast iron Le Creuset type pot which has a lid. This ensures that you have a good shape to your loaf. Oven spring: you will see websites talk about this, it’s very desirable. It’s the initial rising that you get with your loaf once it is put in the oven. Much of the rising takes place in the first 5 minutes. 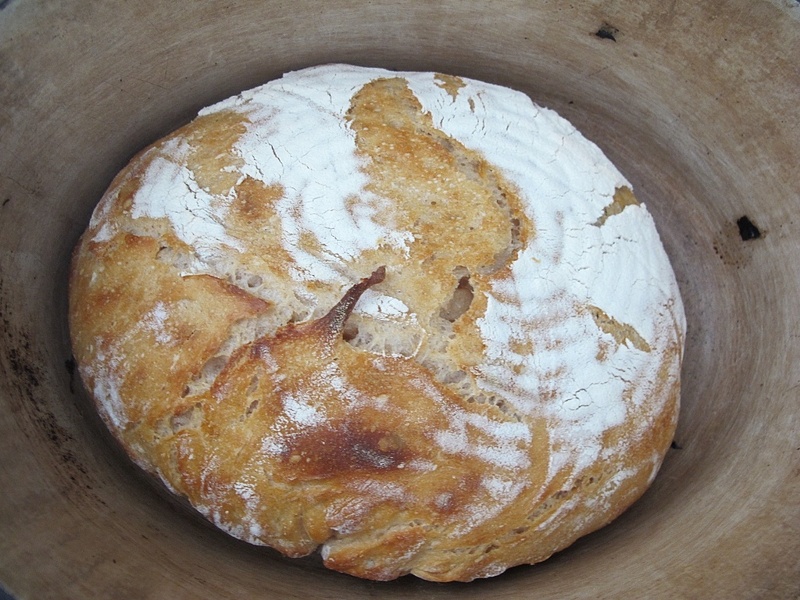 One of the best websites on sourdough that you can read is written by a North London suburban housewife from Portugal. It’s called Azelia’s Kitchen. 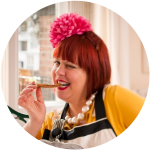 She’s clearly bonkers obsessional in the kind of foodie geek way that I adore. I love her site. So what I’ve ended up with, finally, is a mongrel No Knead Sourdough Bread recipe. This is the only way I can get the bread to retain a lovely shape. 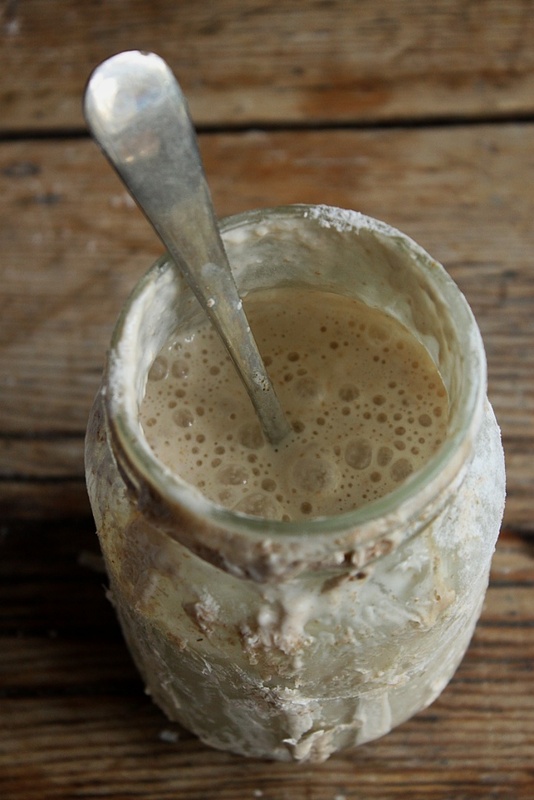 This recipe will keep me going until I manage to make a successful solely sourdough loaf. 1/4 teaspoon of quick acting yeast. Mix this roughly together in a bowl. Cover with clingfilm and leave for 8 to 12 hours to rise slowly. If it’s a hot day, put it in the fridge. Transfer it to the banneton with the heavily floured tea towel, folding and tucking as you go. Leave for one hour. Heat up your cast iron pot for at least 15 minutes. Then tip the dough, trying not to catch it on the side, into the pot. Put the lid on and bake on the hottest setting you have for 30 minutes. Then take the lid off and bake for another 15 minutes. Take out the cast iron pot and tip the loaf onto a grill to cool. If you want to add flavouring, say olives or cheese, or raisins and nuts, put it in the initial dough. Further reading: Michael Pollan’s Cooked, which details Michael’s adventures with sourdough in a very accessible and enjoyable way. Dusting the banneton and dough with rye flour is meant to be better at preventing the dough from sticking, and it usually works. Been making sourdough for nearly 3 months. Had a couple of early fails, including when the loaf hurled itself out of the basket and deflated on the baking tray. Next time it stuck to the tea towel in the basket. My bread all seems to lose shape unless I use a loaf tin, so my best sourdough today was in a baking paper-lined cake tin. Not sure if my doughs are too wet or under-kneaded (the Kenwood exploded 6 months ago, so it's all by hand these days), but doing a bread course in August to check my technique. David, please let me know any techniques that would be helpful. All the pro bakers go on about hydration, but that requires a certain amount of skill and experience to handle I think. It can also be the cause of my flat loaves, I read recently. Are you going to try bread making this summer Siennapops? 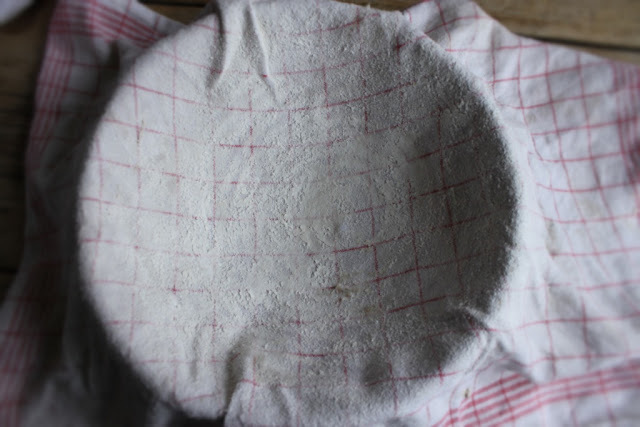 Ditch the tea towel and use rice flour on your banneton. Trust me. Yes that's a good trick for getting a crust…. You bake in a clay pot, how lovely! I use the method outlined in the book 'Urban Homestead' by Kelly Coyne and Erik Knutzen. I haven't had many problems. I have had a blow out of the bread, but not out of the pan. It's all been wonderful, edible and an enjoyable process. I use a cookie sheet with corn flour, water in the bottom of the oven and a flour encrusted towel in the bottom of a bowl. I need no frills and this system is perfect for me! I have been making sourdough for about 5 years, and as we are a Military family my starter has traveled all over the country with us. When I first started making sourdough I had the same issues, flat dense loaves blah. Then someone suggested making the starter a bit more gutsy. I now have my sourdough starter thicker and this really changed the texture of the bread, as did using exact measurements. I use 200 starter, to 700 grams flour and 375 grams water (yes I measure the weight of water) salt and a wee glug of olive oil, makes a pretty good loaf. Ok that is really useful…will thicken up my starter. Maybe make it 80% hydration. Thanks for giving us the measurements for your loaves too! Such a beautiful piece…With amazing photos. Congratulations.